These are the last two beers we will be looking at for Oktoberfest. The candidates tonight come from the two largest solely American owned breweries, Boston Beer Company and Yuengling Brewery. 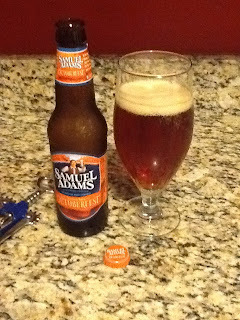 Samuel Adams Octoberfest is the baseline for American craft Oktoberfestbier. Others may have brewed it earlier, but Sam Adams made it popular. It is ubiquitous through out the United States this time of year. Go to your local supermarket or beer store and you should be able to find it on the shelves. If an American beer drinker has drank a US craft brewed märzen or Oktoberfestbier then chances are pretty good it was Sam Adams. Let's take a closer look at this lager. Samuel Adams Octoberfest poured a clear bronze color with a small, rapidly vanishing, tan head. Carbonation on this beer is about average. It is lighter than expected in the beginning of the drink but picks up some fullness in flavor on the saw the flavor comes out after. The roasted malt is noticeable upfront but it gives way to a toffee-like sweetness. The hop presence is relegated to the background but it does yeoman's work keeping everything on keel. It finishes with a mild roasted, bittersweet aftertaste that slowly fades away. It is well balanced but is lighter in alcohol than a traditional oktoberfestbier coming in at 5.3%ABV. Overall it is decent märzen-style beer. It is not overbearing or pushy, just a mild-mannered märzen that works well to introduce people to the style. 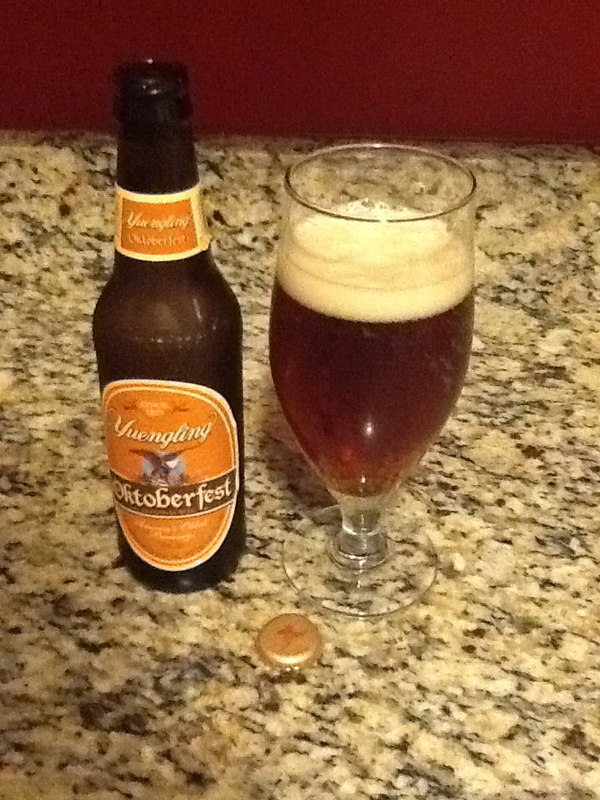 The final oktoberfestbier we are looking at tonight is by the oldest American brewery Yuengling. For Yuengling, brewing Oktoberfest has been a relatively new venture with it only readily available for the last two years outside of the brewery walls. This year in particular has seen there a much bigger push to get this on more shelves throughout the region. It also poured a clear bronze color, though the head lasted longer, slowly dwindling down to small sheen across the top of the beer. The hop is more noticeable in this, leading on the drink and staying in the forefront all through the aftertaste. It strikes me as a beer that is out of balance. The other characteristics you would expect to find, the roasted malt, the caramel/ toffee taste are secondary or even tertiary actors in this beer. They don't really get a chance to shine until briefly showing up in the aftertaste but even then the scene is stolen by the hop who lingers around an otherwise clean finish. That said, don't mistake this for a hoppy beer because it is not. The hop just happens to be the most dominate feature in a relatively mild concoction. You can tell this beer is a Yuengling. They, like Sierra Nevada, have always had a certain quality that carries through all their brews, the Oktoberfest is no exception. My take is this is a beer that needs to be tweaked a bit to find some balance in its flavors. It has potential but it is not there yet. If you are a Yuengling fan though, odds are you will probably enjoy this as it is. It comes in at a below average (for a märzen) 5.4% ABV. 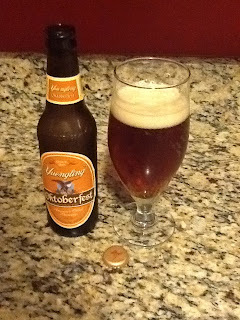 Surprisingly there is no "party line" on Yuengling Oktoberfest.